Rescue horses come in all shapes and sizes and from many different back grounds. 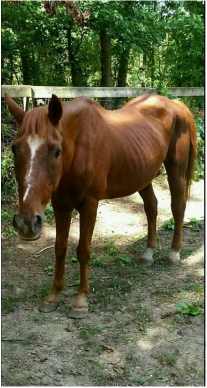 In our eyes a "rescue" is any horse who is in need of care or a fresh start. ​Our goal for these horses is to provide a loving, caring environment where they can live their lives in a happy and healthy setting, as it should be. All horses rescued by MEC will be given the second chance the deserve. We will make every effort to find each horse a loving forever home. Any horse that can not be place will remain a loved member of the MEC family. ​Please take a look at our current rescues who bring us constant smiles and unconditional love everyday. Meet our sweet little "Bug"
​This amazing little girl went through possibly 2 auctions before being bailed out. She is approximately 7/8 years old and has adjusted to all the love and attention people as well as the other horses bestow on her. ​She has become a wonderful companion and friend to many of the other horses. She's the first one to alert everyone with a loud and enthusiastic whinny when I open the doors first thing in the morning. ​fault of her own. We have found with some time to adjust, consistent training and confidence building this beautiful sweet girl can do anything! What can we say? Just look at that face, how could you not save him? ​Dexter has been rescued by a team of loving people. The first was from a feed lot in Western PA, from there to VT and then to us. ​We will be working on all the basics with this little guy, building trust, desensitizing and ground work. ​He will someday make a fabulous children's or small adult mount. ​We were told that he is a Belgium Quarter Horse Paint cross. Put all that together and you get the sweetest horse you will ever meet in the perfect size body, not too big or too small, he's just RIGHT! Congratulations MJ on your adoption of Edison! Our lovely Superman! 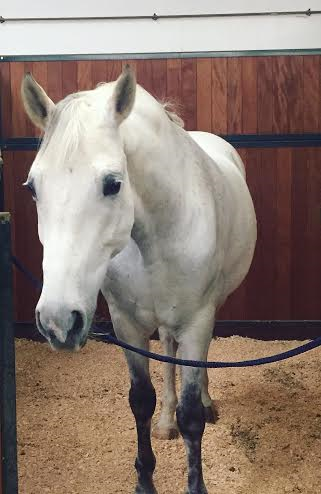 This wonderful gelding is turning 29 years old this year, but don't let his age fool you! He is always one of the first to nicker at you when you walk into the barn and will stand for hours to be groomed and loved on. ​As you can see Clark was quite underweight when we had first met him. In his long lonley life with his previous owner, we were told he had only been seen by the vet twice, had his feet trimmed professionally twice, and has never had his teeth done. We were concerned with bombarding Clark with all of these important tasks in his first week but this old man was a champ! He took everything in stride and never batted an eye. ​The past few weeks have been a whirlwind for Clark - he successfully had his teeth done and finished a round of antibiotics, had his feet trimmed and abscesses treated, and is slowly gaining weight! We cannot wait to see what the future has in store for him!! lunch hay, grooming, hand walking, and more hay. he thrives in all the attention. while running and kicking up his heels with his best bud Bogart in turnout. transformed into healthy, pain free hooves. Bogart! The first thing most people say when they see Beau is "that's a big horse". He is quite tall, approximately 16.2 hands, but the height isn't what makes him, it's that big Warmblood frame! ​This 16 year old Oldenburg X Warmblood is a good example of one of our rescues who just needed a new start. Beau and his previous owner had high hopes of upper level showing but unfortunately that was sidelined due to injury. Relocated to a small backyard barn Beau was able to rest and heal, but as time passed he needed a new job! ​Beau is now slowly getting back into working and has settled really well into his new routine here at MEC. ! We have no doubts with a little more work and maybe a few less peppermints (this gelding loves to eat!) there are great things for him in the future! Getting back to work has done wonders for him. He has begun training with our equine director Mariel working on building muscle, stretching and increasing endurance. 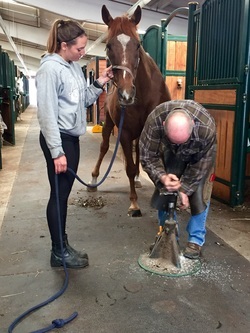 He is a school master that will do anything you ask of him, as long as you ask correctly :) He's even helping our young rider Ani to sharpen her skills and build confidence. Little Andy is a 26 year old quarter horse with a big personality. His owner fell on hard times and could no longer afford to care for him. We offered to help and provide a warm loving home that can give him the care and attention he requires. ​His feet are a little tender from a bad case of thrush and stone bruising, but he has already shown improvement (which is clear by the amount of running he is doing in his paddock). ​Anderson's future is a bright one! Our goal for Andy is to be happy, healthy and always feel loved! Anderson is our bitless wonder! What a wonderful little horse he is, responsive to your seat and leg he will be a great light trail horse for a loving companion. ​We believe Andy was once trained to go Western because he neck reins like a charm and has that smooth lovely jog. How You Can Help - Donations Are Welcome! If you are interesting in finding out ways you can help please contact us!